MMA Titan – MMA News, Updates and Information » Live! 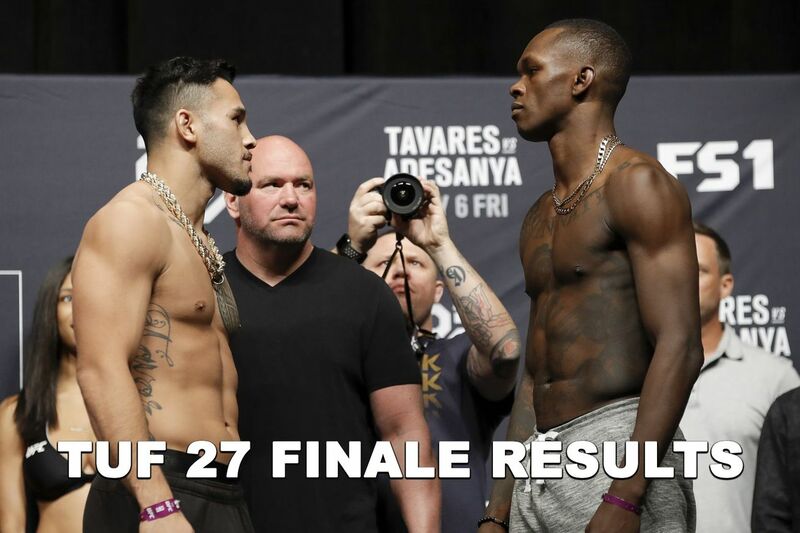 TUF 27 Finale Results & Play-By-Play! Live! TUF 27 Finale Results & Play-By-Play! Ultimate Fighting Championship (UFC) presents The Ultimate Fighter (TUF) 27 Finale mixed martial arts (MMA) event on FOX Sports 1, locked and loaded for TONIGHT (Fri., July 6, 2018) inside Palms Casino Resort in Las Vegas, Nevada. Leading the charge will be the middleweight showdown between grizzled veteran Brad Tavares and striking sensation Israel Adesanya, who occupy the network’s five-round main event. Equally important, we get to find out who is the “Ultimate Fighter” in both the lightweight and featherweight divisions, thanks to finale fights pitting Joe Giannetti vs. Mike Trizano (155) and Brad Katona vs. Jay Cucciniello (145). All that and so much more. MMAmania.com will deliver LIVE round-by-round, blow-by-blow coverage of the entire TUF 27 Finale fight card below, starting with the UFC Fight Pass “Prelims” matches online at 7 p.m. ET, followed by the FOX Sports 1 “Prelims” bouts at 8 p.m. ET, before the main card start time at 10 p.m. ET, also on FOX Sports 1. Round 1: Honchak landing well early. Good right hand by Honchak. One minute in. Back-and-forth boxing so far. Neither has the visible advantage yet. Good right hand by Honchak. Two minutes in. More exchanges. Mofferi shoots and takes her down into half guard.Two minutes to go. Modafferi looking to get her knee free and move to mount. Honchak denying it so far. She briefly gets side control a minute in, back to half guard. Full guard now. Nice pass directly to side control. 10-9 Modafferi. Round 2: Back to trading punches at the start of the round. Modafferi landing some right hands. Honchak lands one in return, gets the body lock, and tries a trip. Modafferi counters into mount and starts dropping hammerfists. Elbows as well a minute in. Honchak regains half guard. Modafferi staying heavy. Two minutes in. Now landing some elbows and punches as Honchak tries to get to her side. Back to mount goes Modafferi, going to work with strikes. Two minutes to go. Nice elbows landing for Modafferi. The ref steps in as the elbows pile up. Round 1: Di Chirico fires a left hand that’s blocked. They trade on the fence, nasty left by Di Chirico. Another overhand left a minute in. Marquez connects with a right hand. Hard body kick comes back at him. Right hook briefly bends Marquez and Di Chirico mixes up to the head and body. Two minutes in. Marquez finds the mark with another straight right. Another body kick by Di Chirico. Straight left. Marquez wobbles him with a left hook and starts marching forward, firing body kicks of his own. Two minutes to go. Di Chirico goes back to the body kick. He catches a leg kick, misses the counter. Straight left, right hook. One minute to go. More counters from the Italian, who shoots for a single-leg and avoids a guillotine. Marquez scrambles up, lands a body kick and right cross. Marquez shots, stuffed. Di Chirico gets wobbled late. 10-9 Di Chirico. Round 2: They trade body kicks early. Low kick by Marquez, combination upstairs and some spinning sh*t. Counter jab from Di Chirico. One minute in. Uppercut finds the mark for Marquez, who lands a counter right. More pressure by Marquez. Di Chirico ducks a spinning attack to grab a body lock. Marquez counters with a guillotine, loses it. They separate. Marquez tries a high kick, lands a low kick. Di Chirico catches a body kick for a takedown. Two minutes to go. Marquez avoids a back-take. Right hand lands clean on the fence. Di Chirico completes another takedown. Marquez uses a kimura trap to look for the back, then commits to the sub. Di Chirico gets his arm out. 10-9 Marquez. Round 3: Check hook lands for Di Chirico. Marquez still on the advance. Another check. Body kick. One minute in. Marquez fires a body kick, eats another jab. Di Chirico tries an up-elbow. Low kick lands for him. Marquez finds the mark with right hands on the fence two minutes in. Marquez tries to spin again, lands a left. 1-2 from Di Chirico. Head kick by Marquez appears to land with two minutes to go. Round 1: Tentative start, both women staying at range. Jab from Ostovich. One minute in. Really just shadow boxing so far. Ostovich lands a body kick. Two minutes in. Both land right hands but it’s Ostovich who stumbles back. Good jab by De La Rosa. Long left hook connects. Two minutes to go. Ostovich struggling with the length disadvantage. One minute to go. More jabs by De La Rosa. Ostovich counters a leg kick with a straight right. 10-9 De La Rosa. Round 2: Both fire right hands. Low-high combo attempt from Ostovich. De La Rosa lands a front kick. One minute in. De La Rosa catches a body kick and tries to trip her down. One minute in. Ostovich defending well. De La Rosa still attached on the fence. They separate. Two minutes in. De La Rosa goes back to the jab. Hard combination lands for Ostovich. Body kick connects, but De La Rosa grabs a body lock, ultimately putting her on the fence again. Two minutes to go. De La Rosa lands a short elbow before they separate. Body kick connects. One minute to go. Ostovich falling short with kicks. 3-2, body kick. De La Rosa left hook, Ostovich overhand. Ostovich lands a spinning back fist and they trade in the center. 10-9 Ostovich. Round 3: De La Rosa fakes a level change, doesn’t connect. Counter righ tby Ostovich, then a body jab. 3-2 connects a minute in. De La Rosa shoots, eats a knee. Pressing Ostovich against the cage. Ostovich counters a takedown attempt with a roll, then looks to transition to a kylock. De La Rosa escapes two minutes in and sets up in guard. Side control now. Ostovich rolls to her knees with two minutes to go. Both hooks in for De La Rosa. She flattens Ostovich out and goes to work with strikes before looking for the choke. One minute to go. De La Rosa works her forearm under the chin and draws the tap. Round 1: Pena lands a heavy knee, but Smullen eats it and hits a takedown, dragging Pena back down when he scrambles up. Side control for Smullen. Pena briefly attempts some sort of bizarre choke. One minute in. Full guard now. Smullen with some ground-and-pound. Pena threatens an armbar, uses it to get to his knees and take Smullen down in return. Smullen looking for a guillotine, loses it. Pena abandons ship when Smullen looks for a leg. Two minutes in. Back to the feet. 1-2 from Pena, 3-2 knocks Smullen back. Combinations piling up and a left hand puts Smullen on the mat, but Smullen goes for a leg. Pena tries to counter with a guillotine and a scramble ensues. Two minutes to go. Pene winds up on top in full mount, still cranking the choke. He adjusts his grip to a power guillotine and that gets the tap. Round 1: Gunther ducks in for an early takedown attempt. Zuniga defending against the cage. Gunther gets him to his rear a minute in. Zuniga working to stand. Short left hands from Gunther. Two minutes in. Gunther changes levels and gets him down again, controlling Zuniga’s legs. Two minutes to go. Zuniga makes it up, hauled back down. Back up, back down. One minute to go. Gunther lands a spinning elbow after Zuniga stands. 10-9 Gunther. Round 2: Zuniga fires low kicks and they trade punches until Gunther looks for another takedown. Knee to the body. Zuniga looking for a kimura a minute in. Gunther completes an outside trip and looks for the back. Zuniga works his way back up. Two minutes in. Outside trip, Zuniga nearly sweeps before standing. Ref separates them. Right hand dings Zuniga, who bangs the body. Two minutes to go. Gunther still wading forward, shoots once again. He completes this one. Zuniga rolls to his knees, gets brief separation. He grabs a kimura when Gunther ducks back in. No dice. 10-9 Gunther. Round 3: Zuniga digs in an early body shot, then some head shots. Another combination and he denies Gunther’s attempted clinch. Body shot, combo. Gunther wades back into the clinch against the fence. He gets Zuniga down, can’t keep him down there for long. Zuniga briefly threatens a guillotine on the fence. Two minutes in. Ref breaks them up. More punches from Zuniga. Gunther again just pushes him back to the fence. Two minutes to go. Gunther shoots, denied. Zuniga firing tired-looking punches, whipping backfists. More of Gunther just marching forward into the clinch. One minute to go. Zuniga escapes and goes back to the body, then the head with combinations. Zuniga goes low-high, lands a head kick. He keeps pursuing Gunther until the bell. 10-9 Zuniga. Round 1: Diamond on the advance, fires a head kick and avoids a knee. Mitchell tries a flying kick and lands good knees to the body. One minute in. Mitchell ties up briefly. Diamond hits a low single the next time they come together. Half guard for Diamond. Mitchell regains guard, tries mission control two minutes in. He switches a deep half guard sweep, but finds himself in a guillotine. Mitchell ducks down for a takedown, but has to surrender top position when Diamond switches to a high-elbow grip. More scrambling and they separate. Two minutes to go. Jab exchange in the center. Low kicks from Diamond. Mitchell lands a knee to the body, then clips the cup with a low kick. Back to the action. Diamond fakes a shot, can’t land the uppercut, and they start exchanging. Diamond looks for another guillotine as Mitchell shoots in, but the angle isn’t there. Diamond eats a knee as he gets back to the feet. Mitchell looks to spin him back to the mat. Diamond defending with a whizzer. 10-9 Mitchell. Round 2: Mitchell shoots in off a Diamond low kick, avoids the guillotine. Diamond uses the whizzer to scramble up. Mitchell shoots again. Diamond defending well. One minute in. Diamond ultimately winds up on top, but Mitchell gets his legs in position for a triangle. Mitchell firing elbows between squeezes. The angle isn’t there but Diamond isn’t doing much to defend. Mitchell elbows piling up two minutes in. Now Mitchell has the angle, but Diamond pulls his head free with two minutes to go. Diamond takes side control. Staying heavy, not looking for damage. He briefly threatens an arm triangle and Mitchell goes to his knees. Diamond avoids the granby roll and starts punching. More right hands form Diamond. 10-9 Mitchell. Round 3: Both men find the mark with early right hands. Low kick from Diamond. Mitchell grabs double underhooks for a takedown, bt Diamond just rolls through and they go back to trading. One minute in. Now Diamond changes levels and puts Mitchell on his back. Half guard now. Two minutes in. Mitchell committing to a kimura, loses his grip. He goes to his knees and Diamond looks for the back, then suplexes Mitchell to the mat when he scrambles up. Landing shots from side control. Two minutes to go. Mitchell regains half guard. Diamond looking for a crucifix. One minute to go. Mitchell goes back to his knees. Good punches from Diamond. Knees to the body. Mitchell looks exhausted. Diamond retakes the back and throws hard shots until the bell. 10-9 Diamond. Round 1: Peterson opens with a flying knee attempt and Bessette shoots in, taking him to the fence. Peterson pulls guard on a guillotine and tries to claim that Bessette is out, but “The Mangler” works his way free a minute in. Peterson gets back to his feet and reverses position on the fence. Knees to the thigh from Peterson. Bessette reverses in turn two minutes in. Now Peterson reverses. Bessette goes for a hip toss without success. They separate and Peterson lands a knee to the body. Swatting right by Bessette with two minutes to go. Combo by Bessette. Peterson chops his leg out with a leg kick, can’t take top position. Hard shovel left by Bessette answered by a right cross. 1-2 from Peterson. One minute to go. Bessette with a glancing head kick and a massive right hand that Peterson absorbs. Clean uppercut and left hook. Peterson keeps coming, eats a flush head kick. Another head kick from Bessette, uppercut, right hook. 10-9 Bessette. Round 2: They go right back to slugging until Peterson puts him on the cage. Bessette tries an uchi mata and Peterson ducks down for a double-leg. They separate a minute in. Counter right from Bessette, uppercut in the clinch. Trading in the center, Bessette getting the better of it. Flush head kick from Bessette and again Peterson just absorbs it. Clean 1-2. Two minutes in. Peterson still wading in. Bessette continues to pick him apart. He shoots, stuffed. Two minutes in. Crushing rights from Bessette. Peterson lands a straight right. He puts Bessette on the cage and looks for a takedown, dragging Bessette to his knees. One hook in for Peterson. One minute to go. Peterson gets his second hook in and lands a 12-6 elbow. More elbows. 10-9 Bessette. Round 3: Peterson’s still going forward, takes Bessette to the fence. Bessette circles away and lands punches. 1-2 from Peterson. He changes levels a minute in. He gets the inside reap, looks for the back, slips out the back door. Then Bessette looks for the back and falls victim to the same thing. Two minutes in. Peterson retakes the back and locks up the body triangle. Landing punches. Two minutes to go. Peterson hand fighting. Still looking for the choke. One minute to go. Bessette survives. 10-9 Peterson. Round 1: Piechota opens with a right hand downstairs. Meerschaert sending out kicks. Body kick lands for him. Piechota fires a left hook and they jockey for position on the fence. Piechota hits an outside trip into full mount. One minute in. Half guard now. He moves to side control, then locks up a Japanese necktie when Meerschaert rolls to his knees. He abandons it and looks for the bac, ultimately takes mount. Meerschaert bucks him off and shoots. Piechota sprawls on it. Brief scramble, half guard for Piechota. Two minutes to go. Meerschaert regains guard and the referee elects to stand them up. Straight left from Meerschaert, who walks into a hard right hand. Piechota follows up with a body kick. One minute to go. 2-3 drops Meerschaert and Piechota takes mount, then the back. He locks up the choke, but good hand fighting from Meerschaert, who goes to his knees. Meerschaert reverses into the front headlock, landing knees. 10-9 Piechota. Round 2: Piechota lands a counter hook as Meerschaert advances. Both land punches near the fence. Overhand right by the Pole, counter hook as Meerschaert lands a body kick. Meerschaert lands a jab a minute in, gets tripped up by a low kick. Another hard leg kick, Meerschaert answers in kind. Left hand catches Piechota leaning. Meerschaert shoots and a scramble ensues. Piechota grabs a guillotine, winds up on the bottom in side control two minutes in. Meerschaert looks for the back, lands hard punches on the way up, and locks up a mean-looking guillotine. He loses it, but starts pounding on Piechota after the scramble. Two minutes to go. Meerschaert burying him in volume. Piechota looking for counters, lands left hooks but starts getting blasted with knees. Elbows now. Piechota looks done. More elbows. Knees, elbows. One minute to go. Meerschaert drags him down, looks for more punches. Elbows too. Manhandling Piechota on the mat and he locks up a rear naked choke, ultimately putting the Pole to sleep.